As more Mazda vehicles begin to include SKYACTIV technologies, after the debut of the full technology suite in the company's flagship sedan, the Mazda6, the Japanese automaker is seeing increased demand for the engines that underlie SKYACTIV and increasing production to meet it. Mazda is increasing SKYACTIV engine output by 25 percent at its key plant in Hiroshima, Japan, which will see a steady rise in the production capacity for the high-compression, high-output engines through to the end of 2014. The expansion will raise capacity from its current 800,000 unit mark to about one million per year. The planned expansion means a new engine machining line at the plant, which will be more versatile and capable, with the current MZR engine line being overhauled to enable production of SKYACTIV engines - including both the gasoline and diesel (SKYACTIV-G and SKYACTIV-D respectively) blocks. Currently, the only other Mazda production facility building the engines is at Changan Ford in China, but the company also plans to produce SKYACTIV engines and components at its new plant in Mexico, starting in the current fiscal year (ending March 2014). Mazda's overall sales goal is to raise global sales markets to 1.7 million vehicles by 2016 and about 80 percent of those sales will be with Mazda vehicles that feature SKYACTIV technologies. 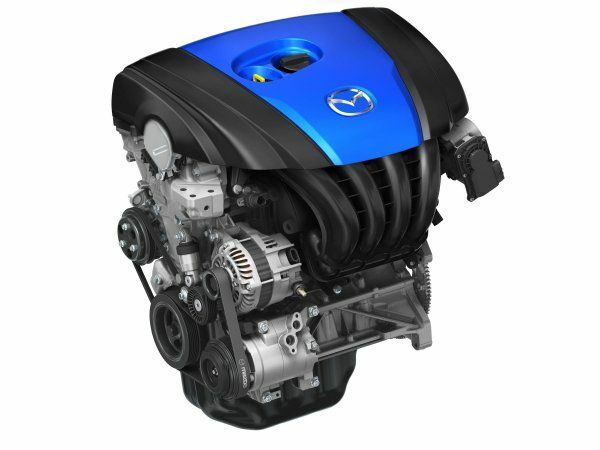 The SKYACTIV engine line is a line of high-compression gasoline and diesel engines that feature high-tech fuel injection, higher torque and horsepower outputs, and more responsive timing when compared to more conventional gasoline options. The technology was developed in collaboration with Ford, which labels its similar engines as EcoBoost.